Thought I'd share my new work station with you. Ever sit in bed holding your tablet reading or working away and sit there thinking the longer the night goes on the heavier your tablet seems to get? Well I do, also when I'm working during the day, I have a bad back and it hurts to be sat forward leaning to reach the table to that I can write. So I took to the wonderful Amazon looking for somthing and I found this wonderdful lap tray. It has a little draw for my pens to be kept in, believe me they are like gold dust in my house. It has a little cup holder. 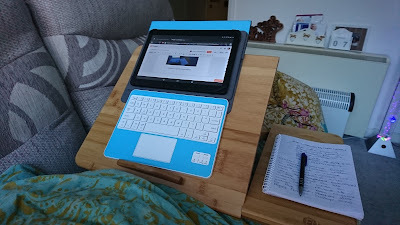 It also raises up and has a little ledge to stop my tablet or book falling off. 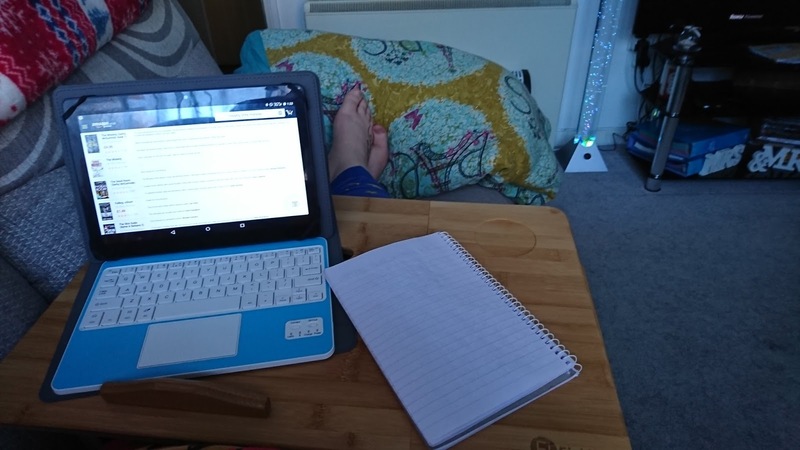 Its a wonderfull little table and has made my working and reading life that much better.